In this review, we will discuss everything this drone does and whether it’s worth the price it’s going for, as well as some pros and cons to consider. 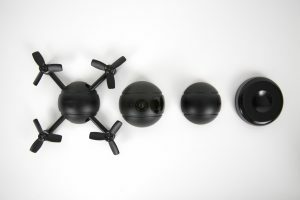 Drone on Indiegogo is never a scarcity, Why PITTA drone? The PITTA is a transformative, autonomous, selfie drone. Sounds like a lot? Well, from that explanation it’s assumed we are dealing with a robot straight out of the Terminator series, but this thing is small. By small, I mean handheld. You can take this thing with you anywhere, from mountaineering trip, kid’s birthday parties, sandy beaches, thrashing seas, and everything in between. In most backpacks, it fits like a glove, given it’s a small sphere hardly bigger than your palm. Get this, that’s not even the most important features. When it comes to video, this thing flies past the selfie competition with 4k video and sixty-four gigs of memory. With a simple changing of the bottom, you can attach a drone fitting that allows it to take to the skies and record from the air, making this idea for those moments where you can’t have someone at beck and call to video everything you do. Not that you walking up the steps is particularly interesting to anyone else, but we are not here to tell you how to selfie. What exactly does this drone do? The PITTA’s sole purpose is that of a camera, but with its innovative design, it does that job in different ways. Firstly, it’s magnetic snap-on design allows you to easily switch between the drone being handheld, aerial, or mounted. That hybrid takes on where you can use it makes it a viable option anywhere you go, solving all of your camera needs with one small spherical package. As a mounted action camera, it can snap burst shots, give you time lapses, and even live-stream your adventures. Long gone are the days where you needed chrome bars and heavy safety equipment to use an action cam, with the PITTA you just mount it and go. Though it does serve as an excellent action travel cam, where this thing truly shines is when it takes to the skies. As a drone, it can start recording you as soon as it gets in the air, allowing you to just sit back and enjoy the experience. Walking up a mountain, surfing a wave, cooking dinner, can all be recorded hands-free. Set it into orbit mode and it’ll fly around you, set it to auto-follow and use its recognition software it’ll stay with you wherever you go. What if it hits a wall? What if I lose it in the air? What if it runs out of batteries and falls one thousand feet to its demise? Well, those questions are answered too. If you love it, it will come back home with a button on the app coupled with the device. If it encounterers terrain the sensor will go around or avoid it. If it runs out of batteries, it has an auto landing feature so you can rest easy if you’ve been using it a while. It’s GPS built-in will allow you to find it if it ever gets lost. However, PITTA is not the first drone with auto tracking. Here is cool 4k Selfies drone with auto-follow and is cheaper on Amazon! These are all qualities that were deemed unnecessary until they became possible. What if you’re not going on some incredible adventure? Then you set it on the charger, and use it as a live stream security cam to protect your household, whenever and wherever you may be. This variability makes the PITTA one of a kind, and perhaps the best aerial camera drone on the market. Secondly, it’s lightweight and well made. Weighing in at just under seven ounces, the PITTA will go toe to toe with any other camera drones on the market, and perhaps be the lightest. The small and spherical design allows for easy takeoff, easy landing, easy travel, and easy control. Lastly, the mechanical design features are made with the user in mind. The camera can tilt up or down and has a protective layer, as does each engine for protection against dust and other small environmental hazards. The rubber padding and sensor prevent water from seeping in the bottom, and all the modules have magnets in them to help people with positioning and alignments for the drone capabilities. These all combine to make a very lean, mean, video machine that can do just about anything. That being said, not all the glitters is absolute gold so there are always some downfalls. The transportable nature and easy to use design makes it not as durable, meaning it can only fly in some light rain and winds. The camera’s runtime is rather small but not much different from an average drone, with the PITTA sitting at fifteen minutes. Long enough to capture a lot of moments, but shorter than we would want. The last question before reaching for your wallet — Is it worth it? The working price right now is $289 for the basic package. This comes with modules for all three modes – Action, camera, and drone — A cradle, an adapter, a gift box and of course a user’s manual. Though that is pricey, most good drones on the market are running for $400+ making this an economical buy. There are other options such as the early bird and the super early bird being offered on Kickstarter, but the basic package will be what most people buy so we’ll use that as for example. The question of whether to buy will always depend on what you feel you need. If you’re looking for a camera drone that looks like it may still need a little work, but you’re willing to wait until it’s developed then the PITTA might be for you. Looking at the comments section of their page, most of the complaints are regarding customer service and fast feedback. These are reasonable concerns, but with a small start-up company, those things are usually going to take a backseat to developing the technology itself. With all of that known, you should understand there will be some waiting involved with this. With such a small company, a high demand, and an entirely new product, things will need to be updated. The camera’s object and person recognition software were created by the company who made the drone rather than outsourcing it to a third party, meaning that there may still be work that needs to be done. As that vision recognition improves, things like autonomous flying accuracy and other qualities of the drone will be updated. If you’re willing to wait for some updates for a cheaper price and a better drone in the long run, then the PITTA might be for you. If you’re focused on getting a drone this instant, then I believe the nearest contender goes for a whopping $800. I think I’ll take the wait. it’s a lightweight, small and easy to carry virtually anywhere you go. Couple that with an added bonus that you don’t need an FAA (Federal Aviation Administration) registration to fly it because it’s not too heavy, and that’s a pro! The hybrid design module makes it a camera fit for almost any circumstance. From the family getting together to the house being secure, it has a mode for just about anything. Though pricey, it’s cheaper than most of the other options on the market, for perhaps a better product. Due to the product being new, and every facet of it being created by the same company, the drone will see constant improvements. From software to firmware, it only goes up from here. Literally. The aerial capabilities aren’t matched nearly anywhere else in such a small package. Terrain sensors, orbiting, and so much more are all pros. The runtime is just a little less than one would like it to be. Fifteen minutes can go by quicker than you think. Can only stand some light weather conditions, though if you’d like to see inside a hurricane, a weather balloon is suggested. No amount of time goes by slower than when you’re waiting for something in the mail. With all of the improvements and with this being a unique product, you may have to do some waiting. Customer service is a quality of life, and from the user reports they spend most of their time improving the drone, so you may be on hold for a bit. You should have read this review in roughly under fifteen minutes. Do you want to capture that moment? With the PITTA, you would have been able too. A little too pricey for this technology piece. Not bad overall.